This fall, the autumn rains started in late August: our sign that summer was over. It was also a good sign that autumn mushrooms would start shoving up through the damp soil. Heavier rains came in late September, and have been with us off and on since then. The timing of the rains after the dry summer apparently brought a bumper crop of mushrooms. We drove to a favorite mushroom gathering place where we have picked chanterelles for years, which shall, of course, remain a secret, because we mushroom gatherers are like that. It is a tiny place under an old hemlock in a second-growth forest. It is hard to get to, off a steep embankment, so most mushroom pickers don’t know about it. 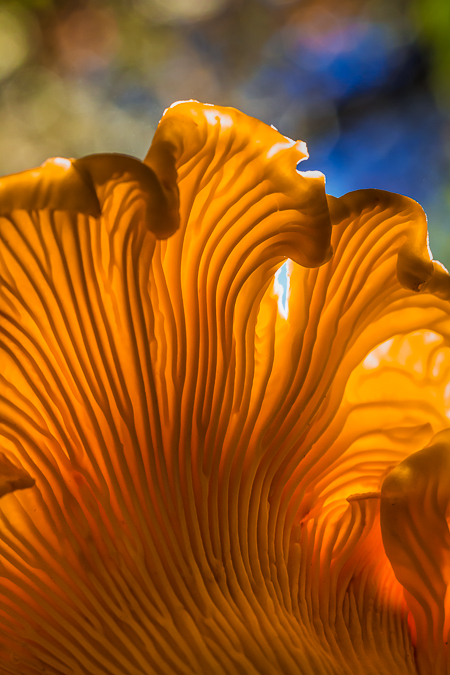 There we have reliably harvested a few Yellow Chanterelle mushrooms for years, but never enough for a feast, unless we supplemented the harvest with a pound of chanterelles gathered from the Costco produce refrigerator. 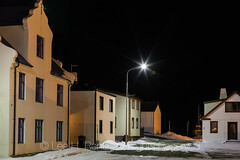 This year we gathered a few more than usual, then decided to spend some time looking outside of our normal favored place. 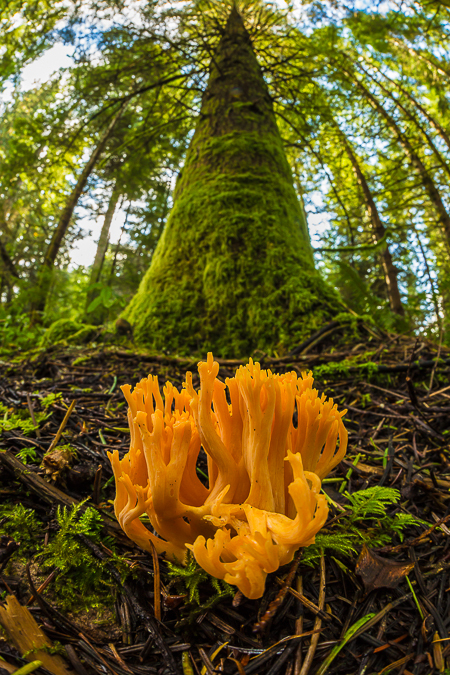 The forest was alive with mushrooms in bright scarlet, orange, and yellow hues, all of which glowed against the mossy forest floor. 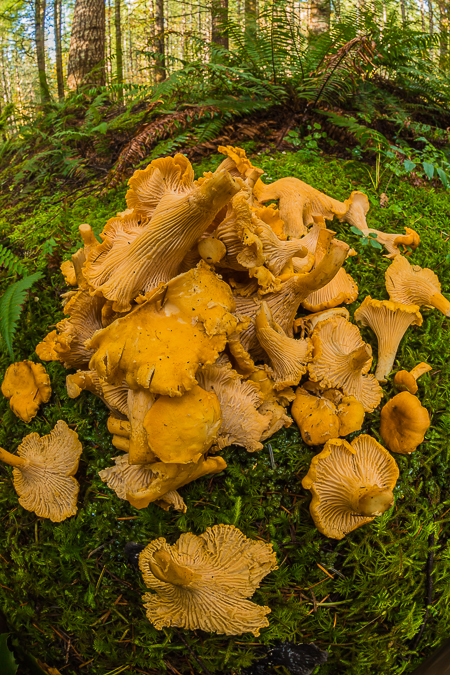 Before long, we found a small concentration of Yellow Chanterelles, and harvested several pounds of them. 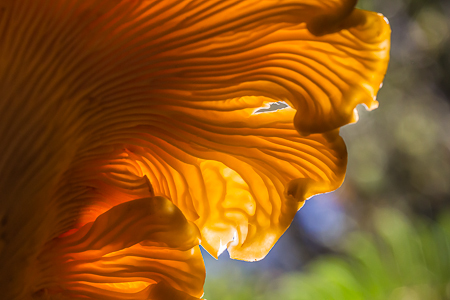 These are distinctive mushrooms, shaped like golden flutes; they have a mild earthy aroma with subtle spicy undertones. 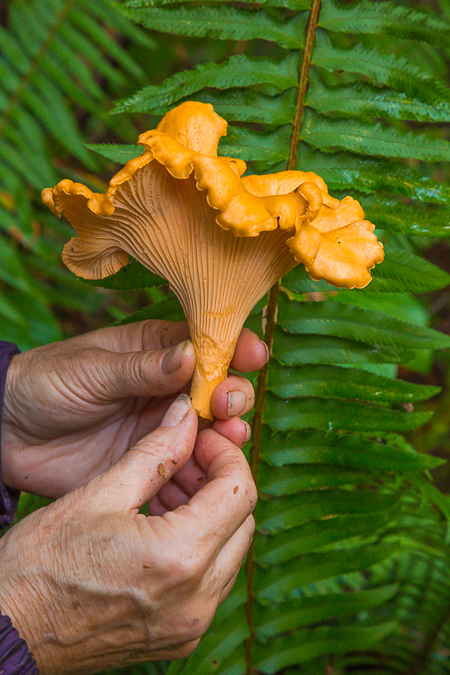 We also found a few Plush Purple Pig’s Ears, which is another kind of chanterelle, and took some of those to try. We went away happy, having gathered enough fungal reproductive organs for several meals. The next weekend we went back, and ventured further into the forest. 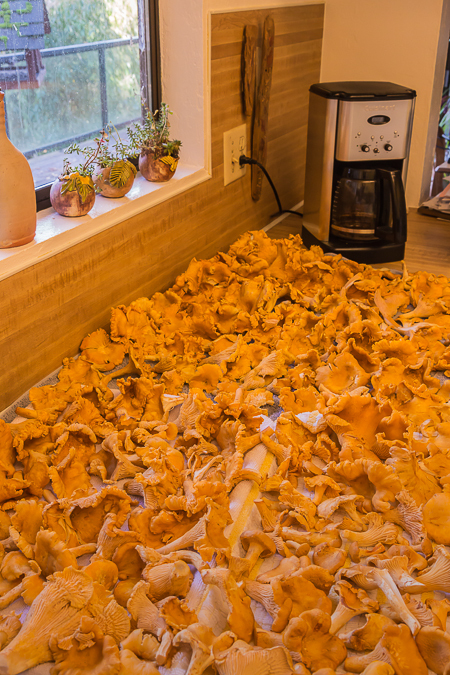 This time we really hit the jackpot, coming away with about ten pounds of fungal gold. The only reason we stopped gathering is that gluttony is a sin. 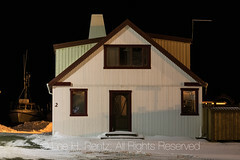 Otherwise, we would have stayed until dark and doubled our fortune. 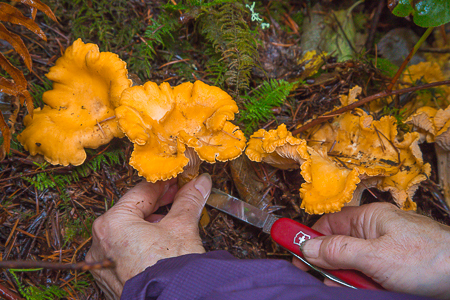 When it comes to Yellow Chanterelles, I keep the cooking simple. I chop them up, not too coarse and not too fine, but like Goldilocks, “just right,” then put them in a hot cast iron skillet with butter, adding a bit of salt and pepper. Then I sautee them until most of the moisture has evaporated out, and they’ve browned nicely and gotten a bit crisp on the thin edges. Some people like them moister; some drier. Then I serve them on lightly browned toast, not too toasty-crunchy, which serves as a carrier for the mushroom flavor without overwhelming it. Beef is also a good accompaniment, but the mushroom flavor is delicate and good beef can shove the chanterelle flavor aside. Sour cream mixed into the chanterelle and butter combo is also good, but my favorite is just plain butter. However, now we have so many chanterelles that I am going to try some recipes I haven’t used since 1991, which was another great mushroom year. Mushroom pie and mushroom stew and mushrooms with eggs and whatever else I can come up with will be on the menu. While looking for chanterelles, I became preoccupied by photographing mushrooms of all sorts, which left Karen to do most of the harvesting. 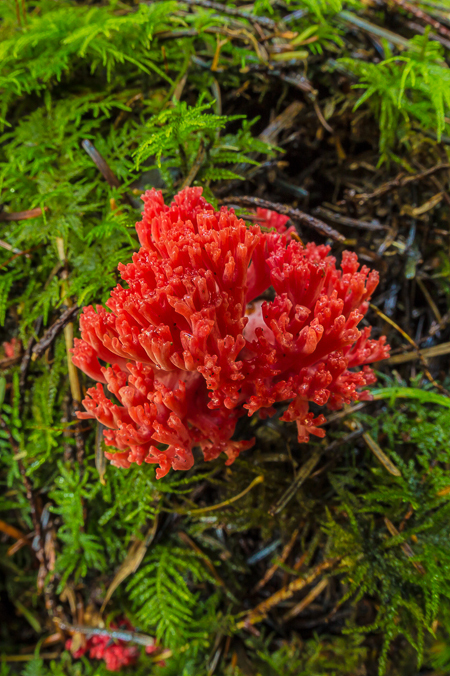 Here, I show a scarlet coral mushroom. 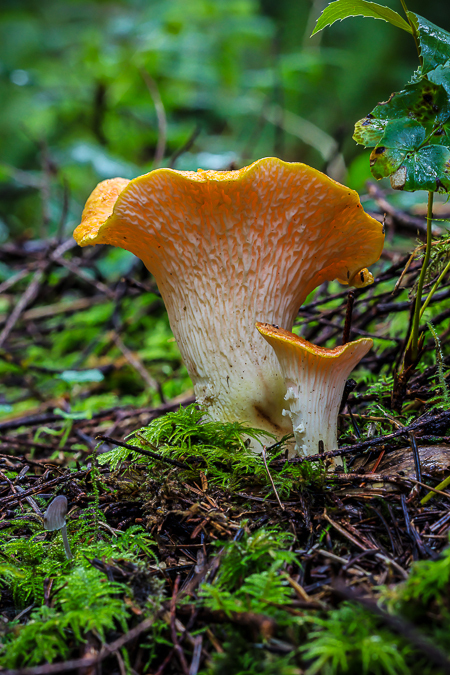 This Woolly Chanterelle–a different species than the Yellow Chanterelle–is iffy for eating, and I won’t try it because of potential liver toxicity, though one classic mushroom book author said it was among the best mushrooms he had ever eaten. As I write this, sitting on a ferry crossing Puget Sound away from Seattle, I can still smell the essence of mushrooms from the spores lodged in my nostrils. 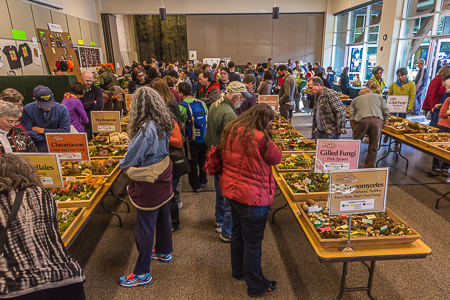 Since it was a great mushroom year, we decided to go to the Wild Mushroom Show in Seattle, hoping to learn a few new wild mushrooms. 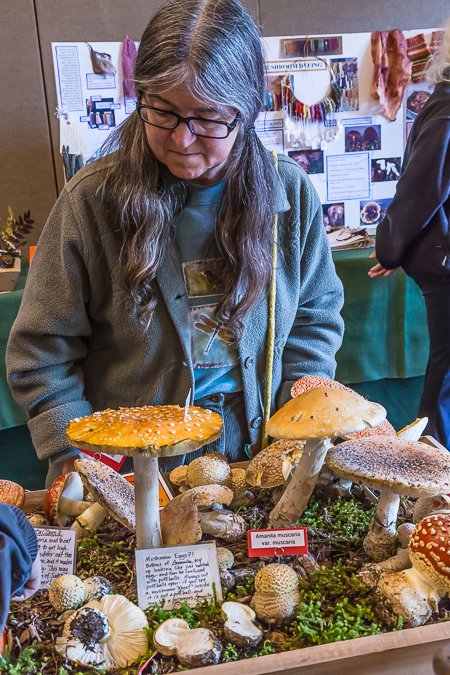 This annual event, organized by the Puget Sound Mycological Society, attracted thousands of people this year to The Mountaineers building at Magnuson Park. 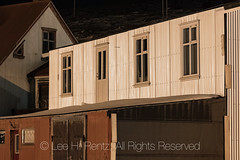 The place was packed with people in this bumper mushroom year. 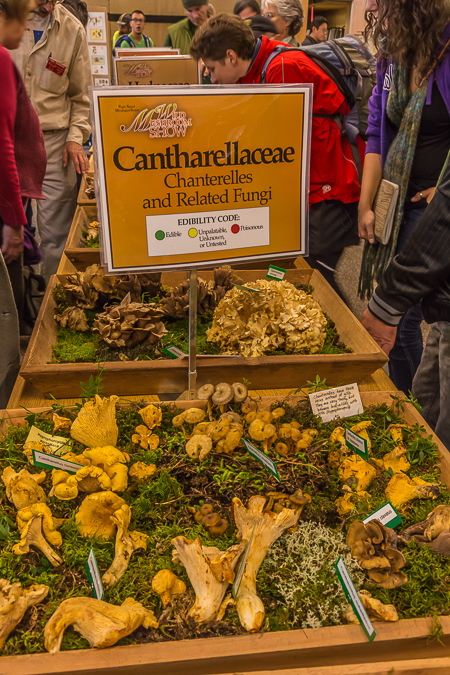 And the scent of mushrooms hung heavily in the air in that exhibit hall; I found it overwhelming, others probably thought it was ambrosia. 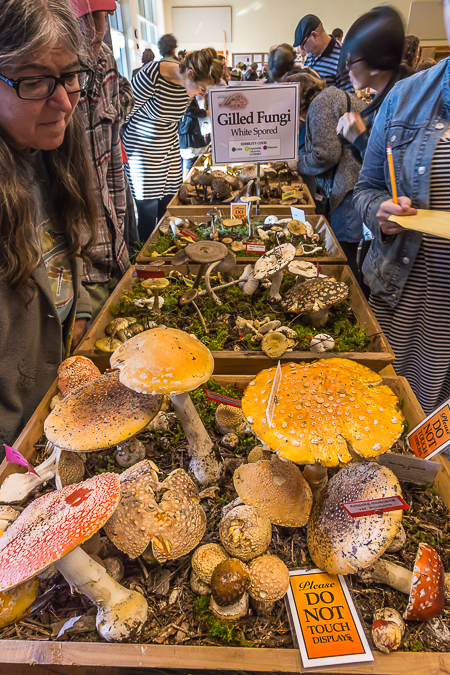 The highlight of the event is a grand display of live mushrooms, organized according to their taxonomy, and identifying whether the mushrooms are poisonous, edible, or somewhere in between, using the three colors of a stoplight. Visitors can sniff and look and photograph–but not poke or prod the delicate creatures. I learned what legendary Matsutake mushrooms look and smell like (fish, and the ocean, in a good way). There is also a cooking area set up so that people can sample wild mushrooms prepared by great cooks. I tasted a mushroom desert soup made with Matsutake and Chanterelle mushrooms, with coconut milk, and tried another way of spicing Chanterelles with soy sauce–both dishes prepared by gourmet mushroom chefs. At the show I also purchased a new book by author Langdon Cook, titled The Mushroom Hunters: On the Trail of an Underground America. I’ve just started reading the book, so I can’t give a full review, but the first part of the book I’ve read is terrific. 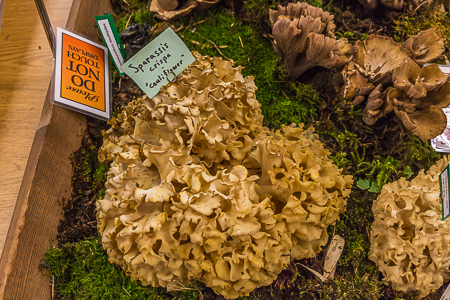 Langdon Cook embedded himself in the culture of professional mushroom pickers, who travel around the West and up into Alaska, harvesting mushrooms for the international gourmet trade. 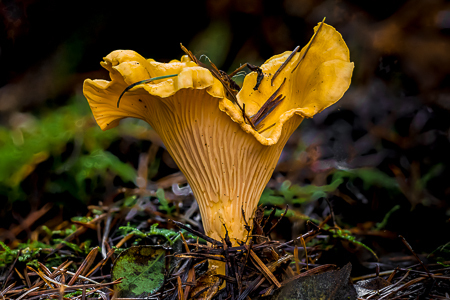 This is a secretive culture that remains on the edges of society; members of the culture camp out and spend their lives in the field searching for morels, chanterelles, and other wonderful mushrooms in the damp, old-growth forests. 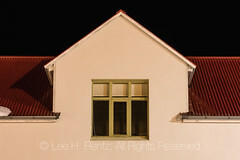 In the introduction to the book, the author describes a surreptitious foray into Mt. Rainier National Park with a picker who hoped to get two hundred pounds of lobster mushrooms in a day. He only got a hundred pounds, but then had to hide his bounty far from his beater car, and pull up after dark to quickly load the bags of lobsters into the car–while watching carefully for park rangers. I was interested in the culture of the professional pickers after seeing so many of them camped early this summer near a forest fire burn from last year. 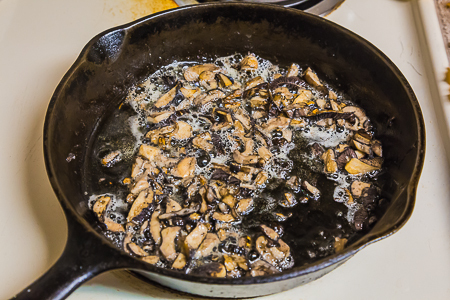 There is a species of morel, known as the Fire Morel, that pops up out of the ashes the year after a fire, and these mushrooms are worth a fortune. Karen and I gathered about a pound of them, but the professionals get hundreds and thousands of pounds. I saw them priced at Seattle’s Pike Place Market this spring for $60 a pound. The boletes are a favorite prize of mushroom hunters, but I don’t yet feel confident enough to properly identify them. 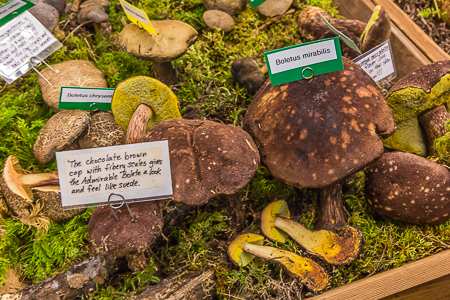 As with many groups of mushrooms, some species of boletes are edible, and some are poisonous. 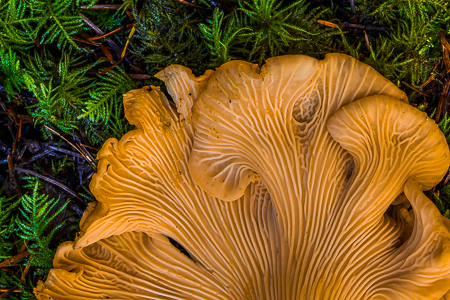 Mushrooms are both big business and a fun tradition here in the Pacific Northwest. I hope to be out in the damp woods again this weekend. Remember, mushrooms can also be deadly poisonous, with the toxins in some species quickly doing irreparable liver damage, so it is essential to know what you’re doing. If you want to pick mushrooms, it is good to go into the field repeatedly with an expert. 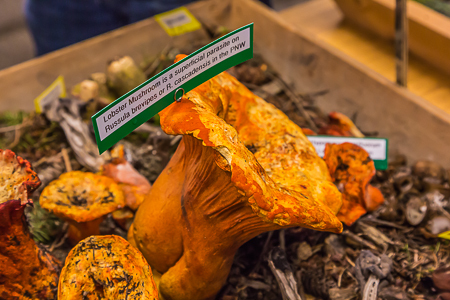 A mushroom identification class would also be a good way to start. 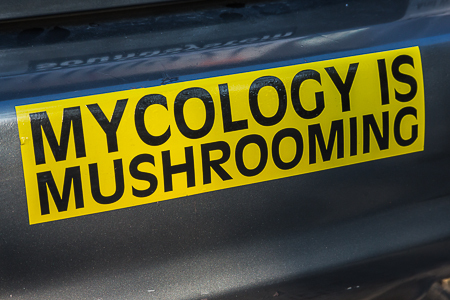 Either way, you should purchase a good mushroom field guide that has recent information about toxicity. 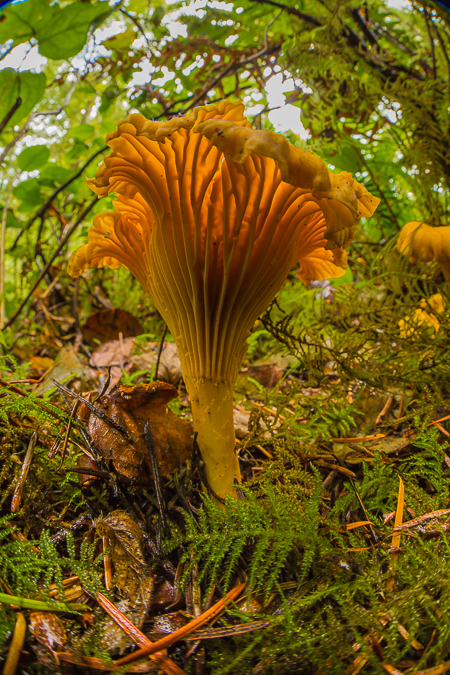 True story: several years ago I was jogging on a trail near the town where I live, and I saw a lot of orange, gilled mushrooms. 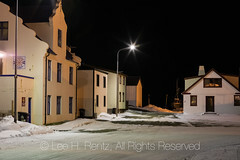 The problem was, at that point I did not jog with my eyeglasses on, and I really couldn’t see what I was picking. When I got home and showed them to my wife, she immediately saw that they weren’t chanterelles. So, wear your glasses. Another possibility is getting lost in the woods; it is all too easy to keep your eyes glued to the ground, and oblivious to how far you’ve come. I don’t recommend going out alone: one elderly and expert mushroom picker disappeared in the Cascade Mountains this year, and searchers never found a trace of her. 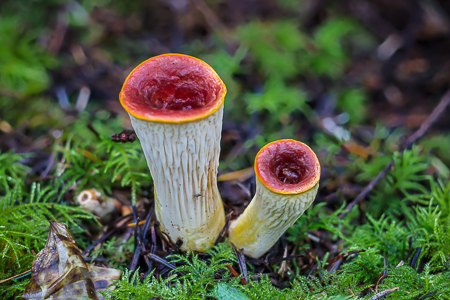 But, for all my warnings, don’t let fear intimidate you: mushroom hunting is fun and is safe, once you know the essentials of identification and take precautions not to get lost in the forest. If you have any good mushroom recipes to share, please feel free to add them in the comments section!